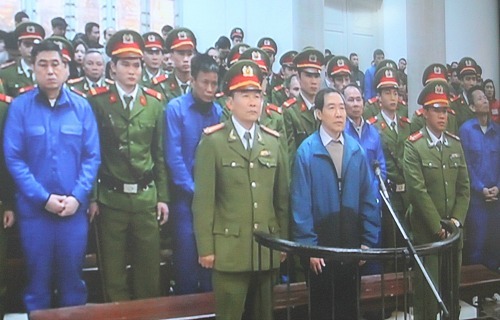 The Ha Noi People’s Court yesterday sentenced to death two former executives of the Vietnam National Shipping Lines (Vinalines) for embezzlement as well as mismanagement that resulted in losses of millions of dollars. On the last day of the trial that began on Wednesday, former Vinalines Chairman Duong Chi Dung and former General Director Mai Van Phuc were both given the highest penalty for embezzlement. They were also sentenced to 18 years in prison for intentionally violating State regulations on economic management causing severe consequences. Tran Huu Chieu, former deputy general director of Vinalines, was sentenced to 19 years, while Tran Hai Son, Director of Vinalines Ship Repair Co. Ltd, got 22 years. The court also sentenced Bui Thi Bich Loan, Vinalines’ former chief accountant to four years in prison; while Mai Van Khang, a member of the Vinalines project management board, and Le Van Duong, a former official at Vietnam Registry, were both given seven years behind bars. Huyynh Huu Duc, Le Ngoc Trien and Le Van Lung, former officials of the Van Phong Customs Office, Khanh Hoa Province, were each given eight-year prison sentences. All the six were found guilty of intentionally violating State regulations on economic management causing severe consequences. Dung and Phuc were asked to pay back VND10 billion (US$ 470,000 ) that they had embezzled and to pay Vinalines VND100 billion ($4.7 million ) for damage caused. Other fines stipulated by the court were: Chieu, over VND39 billion ($1.83 million); Son, over VND46 billion ($2.16 million); Khang, VND12 billion ($564,000); Loan, VND6 billion ($282,000); Duong, over VND15 billion ($705,000); and Duc, Trien and Lung, VND9 billion ($423,000) each. The Court also decided to seize Dung’s three houses in Ha Noi and Phuc’s house in Quang Ninh. According to the indictment, in 2007-2008, Dung and his accomplices violated regulations on investment, bidding and customs procedures for import and export in the purchase and repair of Floating Dock 83M. The malpractice caused losses of VND366.9 billion ($17.2 million) to the State budget, the indictment said. Dung and three others, Mai Van Phuc, Tran Huu Chieu and Tran Hai Son, appropriated almost $1.7 million from this deal, procuracy officials said. The indictment said while knowing that the floating dock, built in 1965, was damaged and had not been in use since 2006, and that the owner offered a negotiable price of under five million USD, Dung still signed Decision 186/QD-HDQT on February 15, 2008 approving its purchase for $9 million from an intermediary, the Singapore-based AP company, which bought the dock from its real owner for just $2.3 million. Dung was arrested on September 4, 2012 after several months on the run.